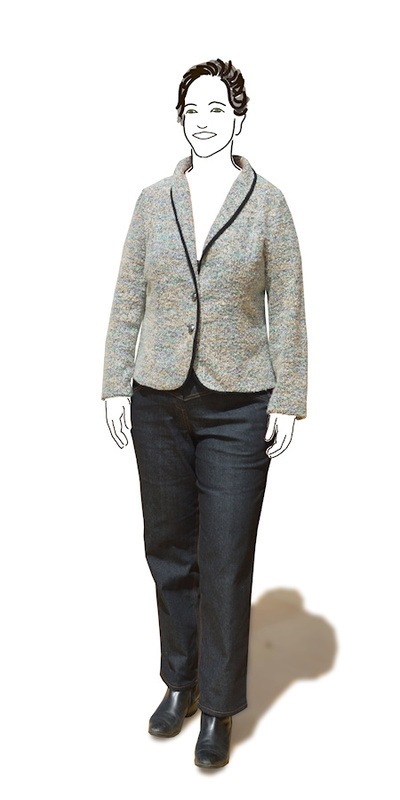 In my zest for cleaning out my pattern drawer, I managed to lose my TNT jeans pattern. (Insert sound of whimpering here). It was based on a Knipmode (Jan 2011) pattern for boyfriend jeans that had been laboriously tweaked into close-fitting jeans than I’ve made over and over (easily 20 times). And it’s gone!!! Waaaa!!! 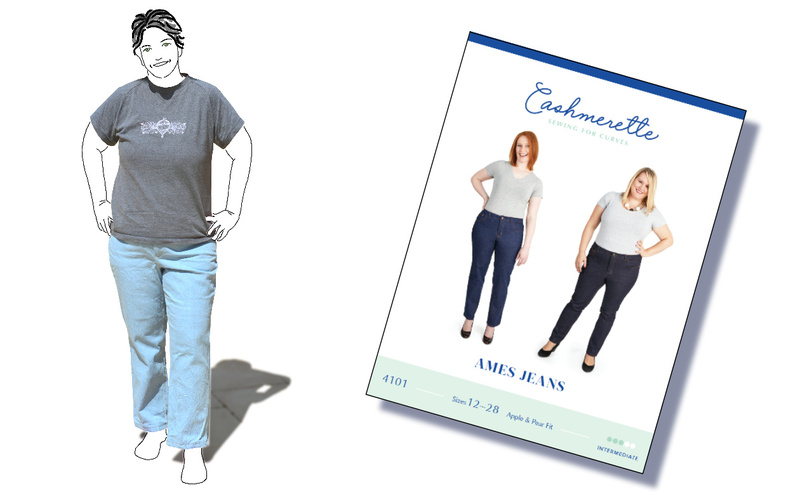 I decided to give Cashmerette’s Ames Jeans a try. I’ve heard a lot of good things about Cashmerette’s drafting for a curvier shape, so I was curious about this pattern when it came out. Having drafts for both pear and apple silhouettes, it sounded like a great shortcut to getting a reasonable fit without too much work. Plus the option for straight or skinny legs. The name kind of gets me though, as it reminds me of the ‘Ames Test’ for detecting carcinogens. I’m trying not to think of what cocktail of chemicals was used to dye and bleach the denim I’ve used. The PDF comes with both A0 and tiled A4/letter formats. The tiled pages have a 1″ grid which makes it easy to line the pages up. I was able to get away with overlapping the edges, rather than trimming them down, by using the grid. The sizes are not layered. Nor are they set out the best for tiled printing, with many pieces extending over 6 pages when they could have been using half that. With 70 tiles, the less taping the better. 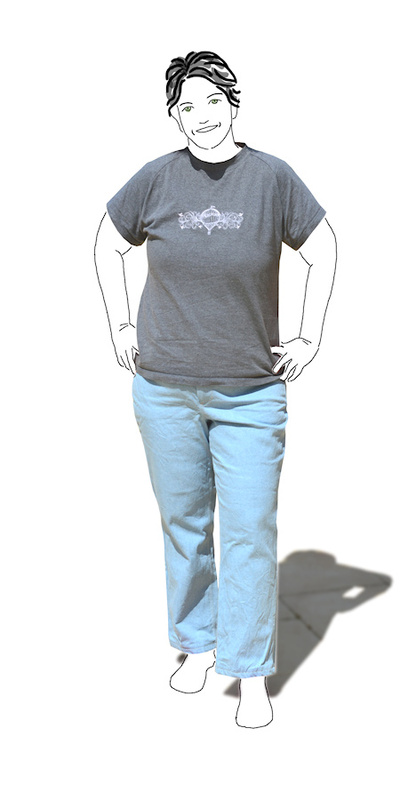 The pattern is sized for stretch denim and comes in sizes 12-28 with hip measurements given for both pear and apple shapes. One of the things I liked about the size chart was that it gave finished measurements for the waist, hip, thigh, knee and calf for both shapes and leg styles. It certainly makes it easy to check which size to use and I wish more pattern companies would do this. I’m between sizes, but decided to go for the larger size because I was going to use a non-stretch denim. For once, the crotch depth and length matched what I needed, without having to do an adjustment. Happy dance! Deciding on pear vs apple fit was actually a bit of a dilemma. Although I would describe myself as a pear, I was actually closer to the apple measurements. In the end I cut a pear with straight legs. I did a quick mock-up using a stretch sateen and looked pretty good. However I didn’t put the waistband on the pattern and this came back to bite me. One think I will change is the seam allowance on the back pocket. It is a scant 1/2″ which needs to be double folded. For a pair of pants that are almost straight of the pattern these jeans turned out quite well. 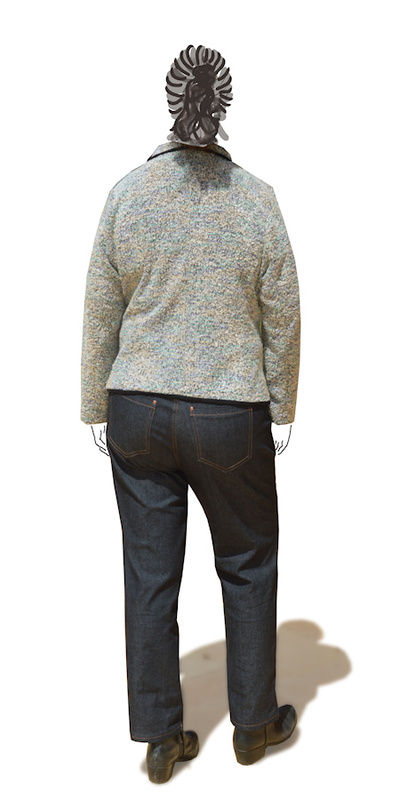 I’ve used a heavy non-stretch denim, so they are more likely to show up any fitting problems than a stretch denim. Crotch curve and pocket placement were spot on. 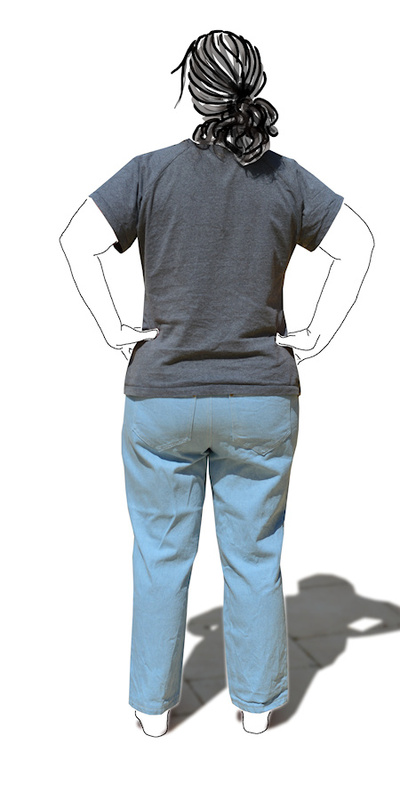 Although the mock-up was a fairly good fit, the final jeans were a lot more roomy around the hips and waist. I did a test fit before the waistband was added and adjusted the side seam a little from high-hip through to mid-thigh. Adding on the waistband, it was clear it was too big. It gapes at the back. I suspected this may happen as the waistband is the same for both pear and apple shapes. 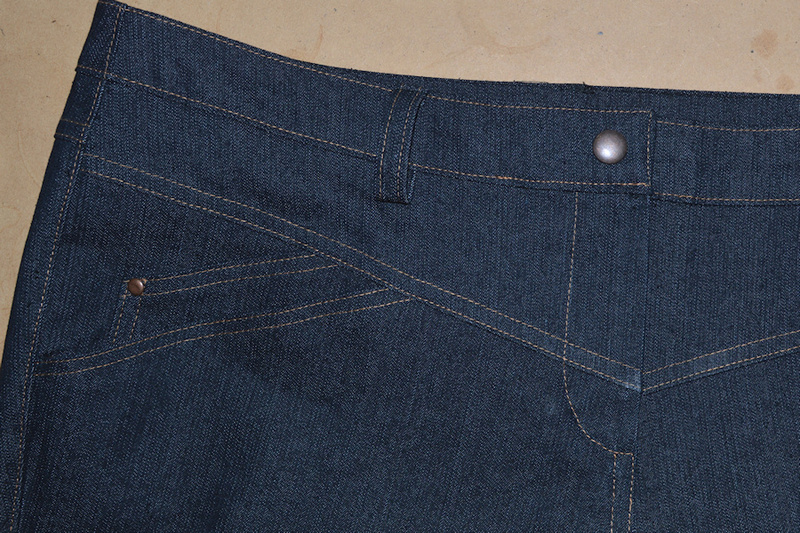 My Knip jeans pattern had a lot more curve in the back waistband and it sat very well. These jeans are very wearable, and I’ve been wearing them around the house a lot. The next version will need a few tweaks. To start off, I’ll go down a size. I also need to add more room to the inner thigh above the knee ( sprint cyclist thighs) and adjust the waistband. Much of the lines showing up in the rear view photo are coming from the pull at the knee and the dropping of the waistband. When I was putting the pattern away, I can across another jeans pattern that I’d morphed from my original Knip pattern, with all its fit adjustments. So excited and relieved that I could do backflips! Just to be sure, I made them up using a stretch denim. Struck a bit of a snag when the zipper failed even before I put them on. 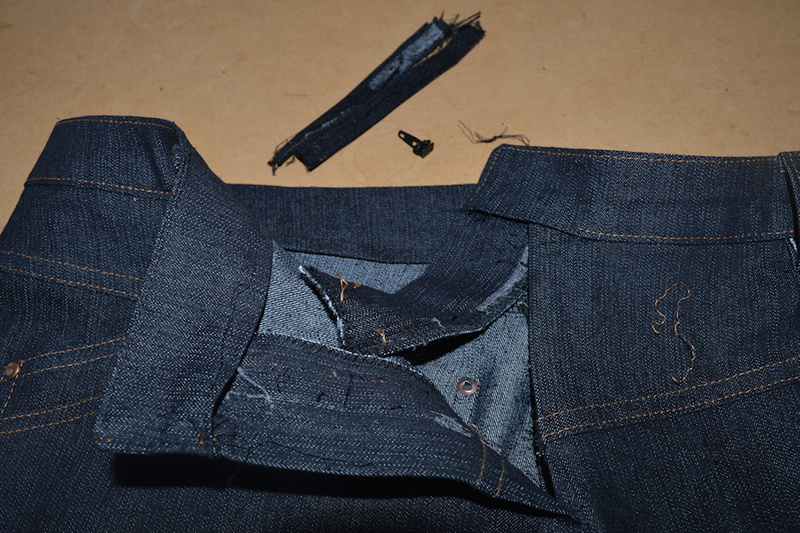 Nervously I unpicked part of the waistband and removed the zipper. I can notice the repair, but it’s not too bad. The top of the waistband no longer aligns, but it was a bit tricky to do with the seams already trimmed down. And the fit… well, I’m a really surprised how much thinner I look in these vs the Ames jeans. The darker colour certainly helps. 🙂 Thank goodness I’m not the only one who thought of the Ames test. The other one that gets my is the ‘Myosotis’ which I keep reading as Myotis – cute insectivorous microbats. I hope the Ottobre jeans go well for you. 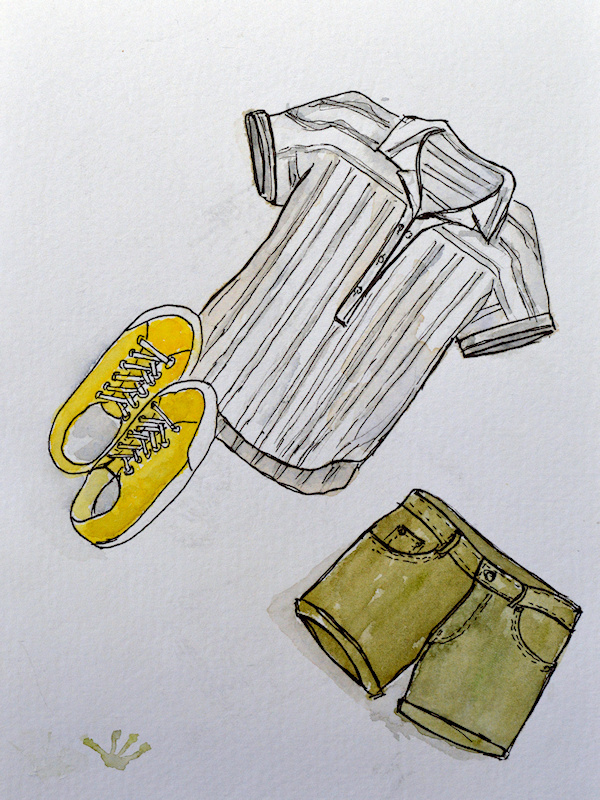 I was tempted to try them as I like the fit of Ottobre patterns ( just not the tracing!). Please let me know how you go. Wow, that difference cannot be explained away with dark fabric. That’s an incredible difference. The entire Knipmode design looks sleeker. I’m glad you found it! Now put that pattern in a big envelope that you write DO NOT THROW OUT on the front of it. And maybe make another tracing. Yeah, you can understand my panic when I lost it. I’m definitely making a copy and will be putting it in a safe place. That’s a great idea. To be fair to the Ames jeans though, they are pretty much straight out of the packet , while the Knip’s have had a fair bit of work put into them. The horror of losing your tnt pattern! When I look at the difference between those patterns I think it is mainly the smaller leg that looks better on you. Maybe you could try the skinny leg for the Ames jeans as I did not find them very skinny at all. I even went back to the pattern to check whether I’d used the straight leg by mistake! Good idea, the ‘skinny’ leg version would probably work better for me. I read your post on these jeans with great interest. 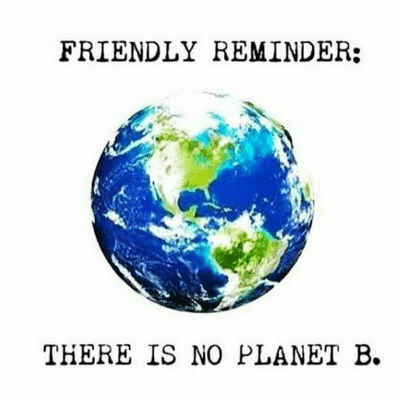 Do you think you’ll go back and give them another try? The Knip jeans are very nice. What a lovely yoke (like) front. I think they are a better fit but as you say they’ve been worked on a lot. Thanks! The yoke design is really interesting. Knipmode used to do some really interesting pant patterns. The knipmode are a much better jean for you but as you say it has been adjusted and the Ames haven’t. Just make sure you don’t put you copy of the knipmode in such a secure spot you forget where it is (I have managed to do this LOL). These second pair of jeans are great. Wonderful fit, great pocket placement. Good for you for finding that pattern again.